As discussed earlier, the loss of income brought about by imprisonment can present significant hardship to families. 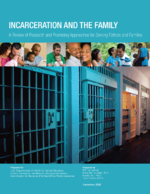 Although figures specific to the households of incarcerated fathers are not available, longitudinal data on divorced families indicate that family income falls by an average of 41% in the first year that one parent is absent (Page & Stevens, 2004). This magnitude of income loss can be particularly destabilizing in households that were struggling financially before an incarceration (Braman & Wood, 2003). Drawing on data from the Great Smoky Mountain study, a prospective cohort study of 1,400 children in North Carolina, (Phillips et al., 2006) found that parental incarceration was associated with family instability and economic strain, which are known risk factors for poor child outcomes. Other studies suggest that income loss may contribute to negative parenting and parenting stress, both of which are associated with poor socio-emotional outcomes among children (Braman & Wood, 2003; McLoyd, 1998).